In the press: I wrote about Adlaon, a small, rural village in the northern, mountainous part of Cebu City in Philippines where a group of us spent three weeks on an overseas community project. ADLAON is a small, rural village in the northern, mountainous part of Cebu City in Philippines. In December last year, my classmates and I spent about three weeks there on an overseas community project. 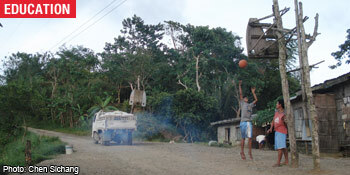 This photo was taken in the evening, as villagers played basketball while vehicles drove by. This makeshift ‘basketball court’ is formed in the middle of the road. Tree trunks are used as part of a hoop. Watching them play, I’ve learnt that we should make the best of our current situation, count our blessings and be thankful for all the things we have now, be it education or family. We should, most of all, enjoy the moment!